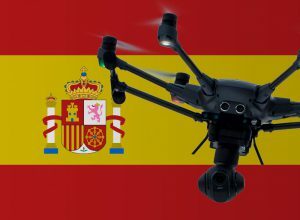 In this article, we have summarized for you the drone laws in Spain. Maximum flight altitude: In Spain, drones may climb up to a height of 120 meters. Maximum horizontal distance and FPV: Drones flights are always to be carried out in direct line of sight, it means that the copter shall not be more than 500 meters away from the pilot. During FPV flights, a second person must monitor the drone with the eye and be in direct contact with the pilot. Compulsory insurance: As far as I know, aviation liability insurance for drones is only required by commercial pilots in Spain. Nevertheless, I strongly recommend that you take out an appropriate policy! Maximum take-off weight (MTOW): Commercial pilots can obtain permission up to a weight of 150 kilograms. For private flights, I assume, a maximum weight of 2 kilograms. But ask the AESA, if your copter weighs more. Distance to airports: Drone pilots must maintain a distance of at least 8 kilometers to airports in uncontrolled airspace (15 kilometers on approved flights out of sight). Other safe distances: A distance of 150 meters must be maintained to buildings. To persons who are not involved in the flight, maneuver must be kept at a distance of 50 meters. Flight bans: Flights over buildings, settlements, and gatherings of people are not allowed. Additional conditions may apply in nature reserves. Of course, flights in controlled airspace are also prohibited. Flights over buildings and people are allowed when the drone weighs less than 250 grams and a flight height of 20 meters above ground is not exceeded. Flight approval: For flights in national parks, you need permission from the administration. The use of drones in no-fly zones must be approved by the Spanish Ministry of Defense (processing time approximately one week). Time of operations: The use of multicopters is permitted only during the day. For drones with a take-off weight of less than 2 kilograms, flights may also be carried out at night as long as a flight altitude of 50 meters above ground is not exceeded. Specific regulations: Regional authorities can issue their regulations for the operation of drones. Therefore, it is always useful to ask around for the rules on the spot. Regulations for commercial pilots: A permit is necessary for business drone flights. The Spanish aviation agency differs in three scenarios. Good to know: You can contact a partner from AESA at drones.aesa@seguridadaerea.es. We have researched the listed drone regulations for Spain to the best of our knowledge. We can not guarantee the correctness of the information. If you want to be on the safe side, please contact the competent aviation authority. Alternatively, you can also ask the embassy in your country for further information about the regulations. Please leave us a comment when you receive news and/or gain experience with your copter in Spain! Never had any problem in security. Always had the drone in carry-on. I flew from Amsterdam to Alicante. Dji mavic pro was in luggage and everything went well. Stop being afraid. If I am reading this correctly, you can’t even fly a Mavic Air (430g) over a building or people? Whatever the country you are not supposed to fly over people or buildings, this is basic safety. thank you for the informative article, would you by any chance know what commercial license is needed for real estate? I am certified UAV pilot in Czech republic by UCL and am allowed to do commercial work here, however I was asked to photograph several villas around Benidorm. Any additional info is very appreciated. Jan, you need AESA license for real estate. We are going to travel from Genona to Barcelona along South of France. I examined some legislation in Europe, so there is no chance to use drone in towns. So we can use drone in the countryside and make pictures of fields and so on. A what about your recent expirience? I am going to ibiza on Monday 10th phoned airport and they told me I had to put it in the hole and I am concerned my last message mavic pro will get damaged ? Hi am going to bring my DJI spark drone to Ibiza this 17 Sept. should not be an issue right? Does anyone offer a photography service for property sales in the canary islands and what pitfalls would you for see. Any advice please? Well, some do, including me, but it is a market where brokers usually takes their own iPhone pictures for you know 1M€ properties and thinks that’s OK.
Great post, very informative. I am traveling to Tenerife in a few weeks and taking my Spark , I’m guessing i will be ok to fly there using common sence. Let us know what experiences you have in Spain! I’ve read somewhere that if you fly a drone in Spain, you need to put a fireproof label on it with some owner data, is that true? Hello, I am going to Begur in Spain this summer. I can not find anywhere whether you can fly here. Do you know this? In addition, you can not be above the beach, can you be on the beach if you are flying above the sea? Hi. I am going to Costa Blanca and wants to make some movies in the nature. Do you know where I can find a map for legal flying, and nature parks with restrictions / forbidden flying ? We have some salty lakes often with flamingos and I dont know if they er nature park, or if it is legal to fly in the area. I haven’t found this link on any English site yet, but thankfully a friendly lady at a visitor information centre helped me out. Hope it helps you all!